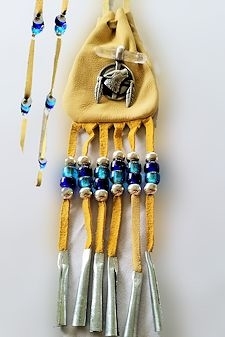 Wow, look at all the detail in this large hand beaded barrette! 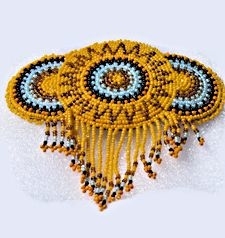 Size 11/0 Cz seed beads in a dark blue and light blue, brown and orange combination against a bright yellow background create a traditional Sun Dance scene. The back is finished in real, butter soft leather backing with a french metal clip. Approximately 5" wide x 4.5" long ( 12.7 cm x 11.4 cm), including the drop fringes.